Pierre André | Founder, French Piano Academy. Born in Paris, Pierre André started playing Piano at age 8 before studying Jazz Composition at the American School of Modern Music (Paris, including Piano Studies with Steve Browman) and Film Scoring at the legendary Berklee College of Music (Boston, including Piano Studies with Robert Winter; Boston Pops Orchestra). Having previously taught at Le Lycée Francais de Los Angeles (LFLA), Le Lycée International de Los Angeles (LILA), Beverly Vista (BV; Beverly Hills Unified School District) and other schools such as First United Methodist Church Preschool (Santa Monica), Trinity Baptist Children's Center (Santa Monica), Language Garden (Miracle Mile), Pierre André has been working full time as a music educator since 2005. 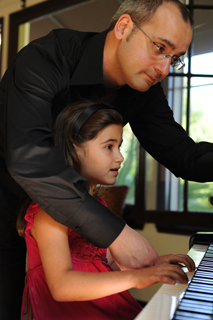 His afterschool music program, French Piano (aka The French Piano Academy), has been put to use in elementary, middle and high schools of Los Angeles for almost ten years. Also a renowned film composer, the works of Pierre André can be found at PAL|Soundtrack Specialist. For more information about Pierre, please visit his portal at www.pierreandre.me. Berklee College of Music | Bachelor's, Film Scoring. Joseph Smith (Orchestrator, Star Trek: The Next Generation). Bob Winter (Pianist, Boston Pops Orchestra). Dave Callahan (Conductor, Brookline Symphony Orchestra). Dave Johnson (Jazz Composition, Berklee College of Music). William Scism (Jazz Composition, Berklee College of Music). Dennis Leclaire (Classical Composition, Berklee College of Music). Jack Smalley (Composition Chair, Henry Mancini Institute). American School of Modern Music | Bachelor's, Jazz Composition.